Rising driver’s license suspensions for unpaid traffic tickets may be putting mobility—and employment—out of reach for many of Milwaukee’s lowest-income drivers, according to researchers and policy advocates. The suspensions can stem from tickets as relatively minor as broken headlights or seatbelt violations. In 2011, the Wisconsin Department of Transportation (DOT) issued about 97,000 Failure to Pay Forfeiture (FPF) suspensions to drivers in Milwaukee County, according to a 2012 report by the Employment and Training Institute (ETI) at University of Wisconsin-Milwaukee. 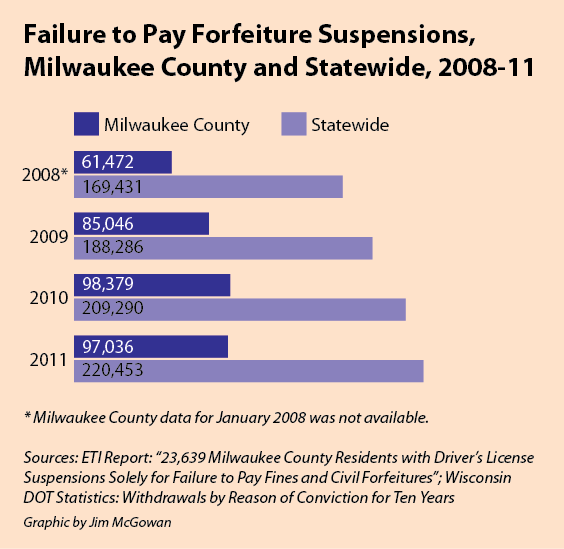 DOT records as of August 2013 show that FPF suspensions have constituted more than half of all license revocations or suspensions in Wisconsin this year. FPF suspensions have risen almost every year from 2008-2011, ETI data shows, and in that period, nearly 24,000 county residents had DOT suspensions solely for that reason. Most of those drivers live on Milwaukee’s North or South Side. Eighty-two percent are minorities; 65 percent are African-Americans. For drivers too poor to pay the fines, the suspensions “dig a hole that’s very difficult to get out of,” said ETI Director John Pawasarat. “Failure to Pay Forfeiture” suspensions stem from “any and all” unpaid traffic tickets from speeding to broken headlight violations, explained Angela Catania, supervisor at the Center for Driver’s License Recovery and Employability (CDLRE). When drivers receive a ticket, they have two to three months to pay the required fine (technically called a “forfeiture”). Once that period has elapsed, courts may order an FPF suspension through the Wisconsin Division of Motor Vehicles (DMV) lasting up to two years or until the forfeitures are paid, according to Wisconsin law. A single driver may accrue multiple suspensions, one for each unpaid ticket. To regain their licenses, Catania said, drivers usually have to pay their fines or begin a payment plan. Drivers must also pay a $60 reinstatement fee. The road to an FPF suspension can begin with a parking ticket, according to Catania. Once drivers have an FPF suspension, they can receive multiple tickets in a single traffic stop, creating a “vicious cycle” of unpaid forfeitures that low-income drivers can’t escape from, according to Molly Gena, supervising attorney at CDLRE. FPF suspensions are a reasonable response to traffic violations, according to Chief Court Administrator Sheldyn Himle, speaking on behalf of the Milwaukee Municipal Court. Himle said that the consequence matches the violation. CDLRE cofounder and volunteer attorney Jim Gramling believes the issue is more complicated. In his 21 years as a Milwaukee municipal judge, Gramling said he saw “hundreds of thousands” of traffic cases. Though some “irresponsible” people may choose not to pay, he said, others are simply unable to do so. Todd, of Wisconsin Community Services, agrees, adding that two-year FPF suspensions are ineffective if the goal is to collect the fines. 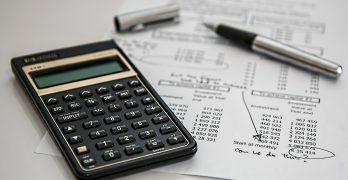 According to a CDLRE analysis of Milwaukee Municipal Court payment patterns, individuals make almost 92 percent of all payments within six months of the judgments. FPF suspensions are rising statewide. They have increased 44 percent from about 170,000 in 2008 to 220,000 in 2011, according to DOT data (see chart, left). In 2012, those suspensions accounted for a little more than 55 percent of all suspensions or revocations in Wisconsin. According to the CDLRE, the increase is likely due to the recession and insurance laws. In June 2010, Wisconsin became one of the last states to introduce mandatory insurance. Since then, tickets for not having insurance have become the fourth most common traffic ticket in the state, as of 2012 records. “Because of this vast number of violations being written now for operating without insurance, people who can’t afford it are being given more tickets that they can’t pay, and the suspensions are piling up,” Gramling said. The suspensions do not affect all Milwaukeeans equally. According to Pawasarat, unlike Operating While Intoxicated suspensions, which are broadly represented citywide, FPF suspensions are heavily clustered in the city’s poorest minority neighborhoods. Many of those who cannot pay, he added, resort to driving “under the radar.” “If you see yourself as not having a prayer [of having a valid license], you’ll just drive anyway,” Pawasarat said. Jose, who declined to give his last name, is one of those drivers. A South Side resident and parent, he lost his license in 2003 due to an Operating While Intoxicated offense. Jose said he stayed off the road for five years after the incident. But when he began trying to pay off his tickets and get his license reinstated, he explained, driving became a necessity. Working and keeping a low profile, Jose said he now drives “only when it’s necessary.” He hopes to save enough money to pay his fines and have his license reinstated in order to get a construction job. The CDLRE, 700 W. State St., aims to help individuals in Milwaukee County with FPF suspensions and other driver’s license issues. 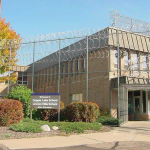 Founded in 2007 and operated by Wisconsin Community Services, the center also is supported by Legal Action of Wisconsin, Milwaukee Municipal Court and Milwaukee Area Technical College (MATC), according to Todd. “The center was created because the founders saw a gap in the community for people who had a suspended or revoked driver’s license with a low income who didn’t have the means to pay thousands of dollars in non-moving tickets,” Todd said. 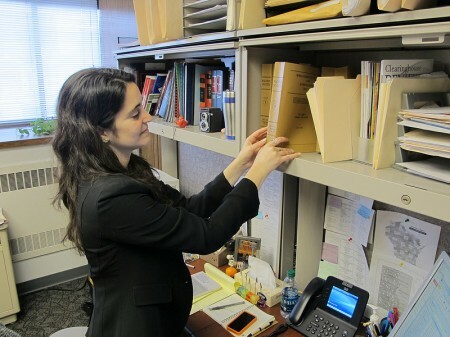 The CDLRE aims to help county residents recover their licenses through case management and legal services, Catania said, with a target of enrolling 325 residents and advising 400 people at community outreach events each year. The center’s current license recovery success rate is approximately 60 percent, she added. Clients are all at or below 200 percent of the federal poverty level, and most are African-American. 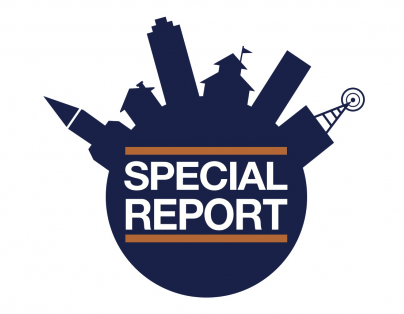 All get to CDLRE from referrals by organizations such as Milwaukee Municipal Court, MATC and Milwaukee Urban League. In addition to directly assisting residents, the CDLRE has championed four successful state-level reforms, Todd said, including Wisconsin Act 102, which ended mandatory license revocations for drivers with four Operating While Suspended convictions. The majority of the CDLRE’s clients are dealing with FPF suspensions, according to Gena, who leads the center’s two-person legal team with support from Gramling, a volunteer attorney. Driver’s license law is complicated, Gena said, in part because some clients must deal with more than one jurisdiction or court system. Gena works with clients to recover their licenses, typically by establishing payment plans or community service arrangements through which clients can have their suspensions lifted while they pay their fines. One of the people depending on the Center’s assistance is Hakim Fudge, 22, who lives on the North Side. Fudge’s license expired in 2010 and is currently suspended for 15 unpaid city tickets. An MATC student in accounting and business, Fudge continued to drive. Not having a license has been a “big problem,” he said. “I get pulled over a lot,” Fudge said. “I get more tickets on top of more tickets. It’s put me in a hole.” Fudge hopes to regain his license with the CDLRE’s assistance while continuing his education. Not having a license is “the most important barrier to employment which you can fix,” said Pawasarat, referring to CDLRE’s efforts. Even for those individuals who can take the bus, the situation is getting more difficult. 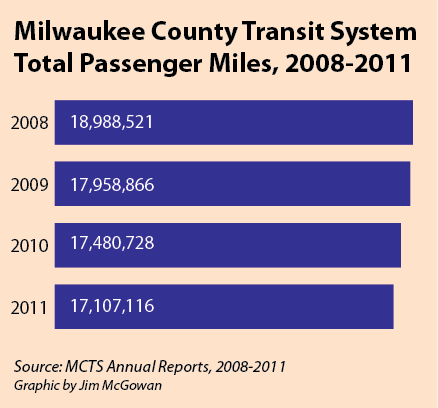 Public transit mileage has declined every year since 2008, according to Milwaukee County Transit System (MCTS) reports (see graphic, left). Employers may also use a driver’s license as a “measure of responsibility,” utilizing it as a filter on applicants even in non-driving occupations, according to Catania. The CDLRE hopes to address FPF suspensions directly with a new legislative proposal to reduce suspension lengths from two years to six months. Todd said the CDLRE is “really hopeful” that the nonpartisan bill can be passed and hopes the process will start early next year. She added that it has state-level Democratic and Republican support, but declined to name individual legislators. FPF suspensions, the proposal states, “exist solely as a forfeiture collection method” for courts, but more than 90 percent of drivers pay in the first six months. The longer suspensions, which exceed some drunk driving suspensions and revocations, “only serve to penalize low-income drivers,” according to the proposal. Courts would still be able to intercept state tax refunds to pay overdue forfeitures that outlast the suspension period, Todd said, so the CDLRE believes no revenue will be lost. “We actually think it [revenue] will increase because people will be able to pay fines better [with fewer suspensions],” Todd said. This article does not address the effect of drivers with multiple violations, on how they are detrimental to people who do not have violations, have insurance, and have cars that are safe. I live on the north side and see all the time drivers with no license plates, bald tires, and unsafe looking cars. When car accidents occur with these violators, they have to insurance, no license, multiple people driving same car, and then add drinking or drugs to that. My insurance is excessively high because of my zip code. A lot of people just don’t care and refuse or postpone paying. How can as the article says can one get 15 tickets and not take tickets seriously? These guys impact all drivers in a negative way. The article should show how much they cost the good, safe drivers. I can barely afford a parking ticket which they hand out like candy all over downtown and the east-side. At $50 each if you don’t pay that can really add up. The 20 feet away from a crosswalk really gets me. Am I really hurting anyone parking 10 feet away from a crosswalk? Or parking 5 minutes longer when the rest of the street is empty for other cars to park? I don’t think they should go up in price the longer you wait. I should be able to pay when I have the money.